Please join us to say 'Thank you' to Dennis Paul and 'Welcome' to our new piano teacher Angela Argenzio. Mr. Dennis Paul got a new Job and is unable to teach piano in our music school. Dennis had taught our children key board for the last two years and had conducted a recital last year. We want to extend our sincere thanks and gratitude to his dedication and hard work. We are happy to welcome our new teacher Angela Argenzio. Angela Argenzio has an undergraduate degree in Music and Masters in Music Therapy from New York University. Angela holds music teaching certifications for the state of New York and New Jersey. Angela worked in the public and private education system as a music educator for grades pre k- 12 and as a certified music therapist working in hospital settings with children and adults. She holds certifications in the Musikgarten,Music Together and Orff approaches to early and elementary music education and has a private piano teaching practice. She sang in various opera productions with the Hudson Lyric Opera and has sung as soloist for various churches in the county. She is a Catholic and has completed all the requirements of the diocesan Child Safety guidelines. Music school is open to members and non-members of the church. Classes are offered on Sunday's after the English mass from 1.30 to 3.00 PM. Fee $75/month for 4 classes. If anyone wish to join the class, please contact the church help desk or Sajan Thomas at 845-321-0781. Just a friendly reminder that our Parish's Lenten Retreat starts tomorrow, Friday, February 19 at 5:30 PM with the Holy Qurbana. We hope to see you all for a time of spiritual nourishment. Please feel free to extend an invitation to your friends and family as well. We deeply regret to inform you, our parishioner and active member Joshy Mathew/Ranny Mathew's beloved father Kuruvilla Sebastian (91y) passed away in India today. Ranny is in India. We share our deepest sympathy and condolences to the sorrowing family. Let us pray for the departed soul. The funeral services will be held in India. Unfortunately due to the weather advisory on Saturday and Sunday we are cancelling 'parent's night out & kids movie night event'. We will try to organise a similar event as soon as possible. Sorry for the inconvenience and stay warm. Our parishioners Roy and Kochumon's (Malayalam Pathram) brother Alexander P. Chacko (63) passed away this morning in Pennsylvania. As a community, we share our deepest sympathy and express our condolence to the sorrowing family in this difficult time and pray for the departed soul. Rd, Huntingdon Valley, PA 19006. 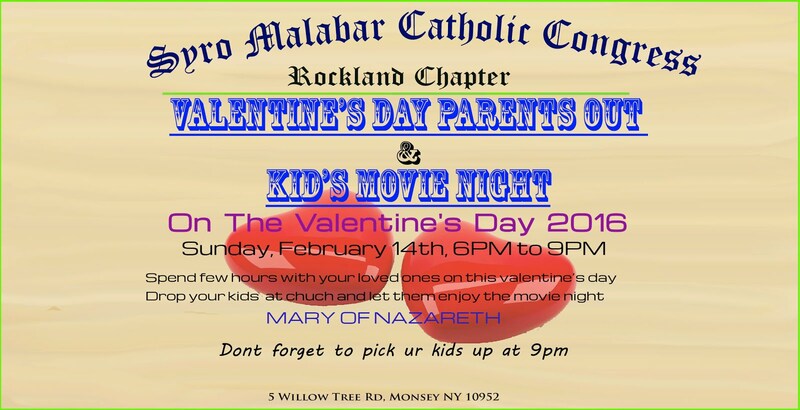 SMCC Rockland chapter is conducting the kids movie night on Valentine's day(Feb 14th-2016) , in order to help hard working parents to go out and spent time with each other. We will entertain kids with movie and their favorite foods. No registration is needed for this free event Please see the attached flyer. As mentioned earlier we will have Holy hour ( Eucharistic Adoration) instead of night vigil. It will be following Mass and Novena tomorrow, friday Feb. the 5th. Hoping to see you all there. The attachment includes a newsletter published by our Chicago SM diocese. This one is specially focused on the Lent and Easter. The name of the newsletter, Mar Valah is the Syriac words for "MY Lord and My God" (St. Thomas). Let us prepare ourselves for our 'Vibhoothi'​ (Ash) Mass that we look forward to on Monday, Feb 8 at 7.00 PM.